Looking for a way to jazz up your next dinner party? How about delivering each course to your guests by miniature train? The team at TrackTile Tables make amazing tables that really will let you play with your food. I have a large collection of wooden trains and track languishing in a cupboard because my son feels he is too old for them, and my daughters aren’t really interested. 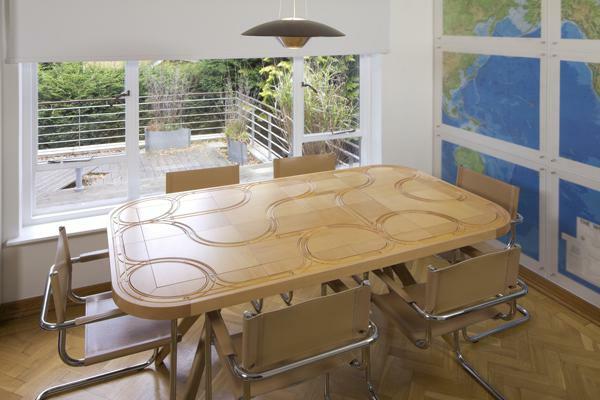 I had just about come to terms with our train time being over – until I saw this dining table. Honestly – words just about fail me. I love it so, so much. The wooden panels that make up the surface of the table can be removed and flipped over to a smooth underside, and you can choose to customise the look of the track as well as the size of the table. Compatible with Brio trains (and other well-known train sets), the tables begin at £1950 (before tax, for those resident outside the UK) for a four-seater table. This price doesn’t include delivery, but does include a set of motorised Brio trains! Have a closer look at the TrackTile site for full information about pricing, dimensions and how to order.